On the welcome screen, click "Missing Tracks"
All of the tracks which are missing from your hard drive will be displayed. Click "Remove All Missing Tracks"
Tune Sweeper contains the ability to find and list all missing or 'dead' tracks in your iTunes library, i.e. tracks that iTunes shows with an exclamation point. A missing track is a track listed in iTunes but whose file on your hard drive is missing. To see which tracks are missing in your iTunes library, select the 'Missing Tracks' tab at the top of Tune Sweeper. Tune Sweeper will then scan your iTunes library. 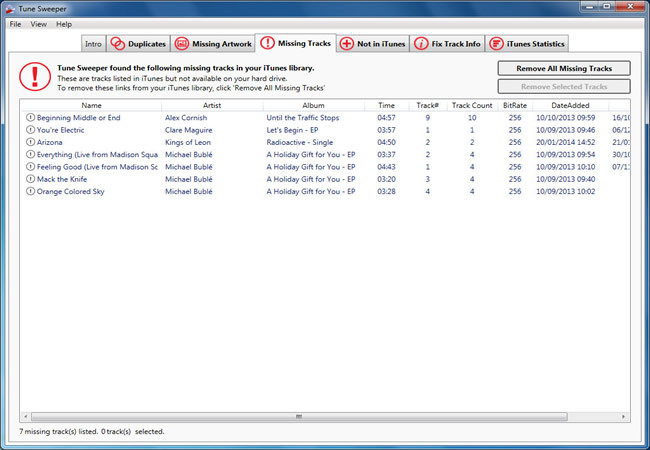 Once Tune Sweeper has scanned your iTunes library, it will display all of the missing tracks in iTunes in one list. Tune Sweeper can remove the dead links in iTunes that are pointing to missing media on your hard drive. Click 'Remove All Missing Tracks' to tidy up your iTunes library by deleting missing tracks. Alternatively, you can select which tracks you want to remove and then click 'Remove Selected Tracks'.